If you are interested to use any of the image(s), please read the conditions carefully. 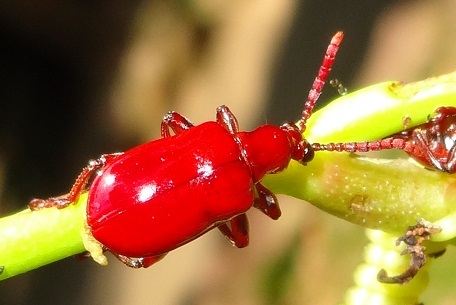 The first time that I took a picture of this all-red beetle was in March 2010. It was a lone beetle. A year later in February 2011, I spotted another lone beetle around the same location, a small semi-nature park. 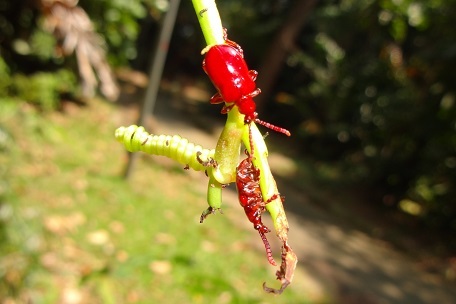 Another 2 sightings took place in 2011 in March and November and in both situations, a lone beetle was seen. 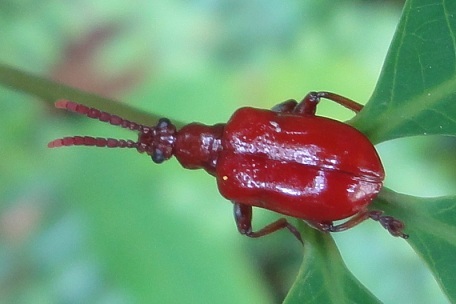 The unique feature of this beetle is that its whole body is red in colour, including the antennae and legs. There was still no clue on its identity and host plant. 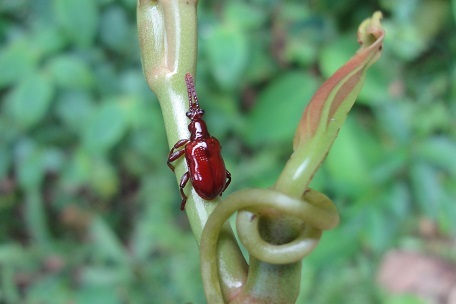 As the beetles were found on different plants and they were not feeding, it was not possible pinpoint the host plant. After the 2011 sightings, the beetle seemed to disappear. The breakthrough came about 3 years later in February 2014 when the beetle was spotted again. This time round, the mystery of the host plant was finally resolved. 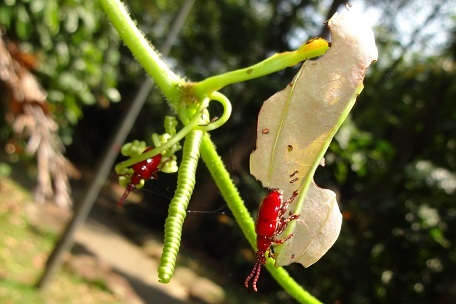 Five beetles were found on a Sarsaparilla Vine (Smilax setosa) and some of them were feeding on the young leaves of the vine. 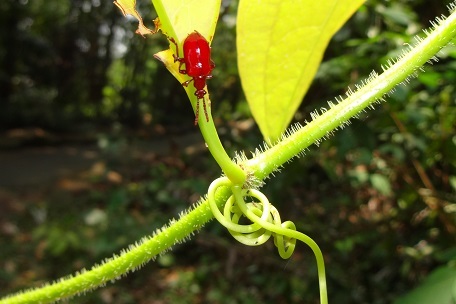 When I checked back the previous pictures when this beetle was found, one seen on September 2011 was actually on this vine (the first picture below on the left). 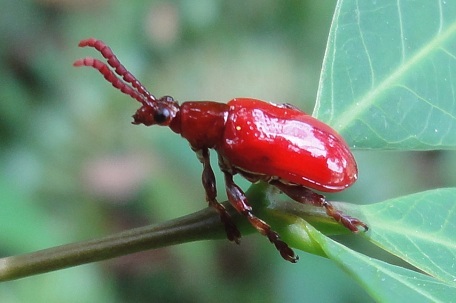 After finally confirming the host plant of this beetle, its identity remains a mystery. It is likely to be a Lilioceris species. 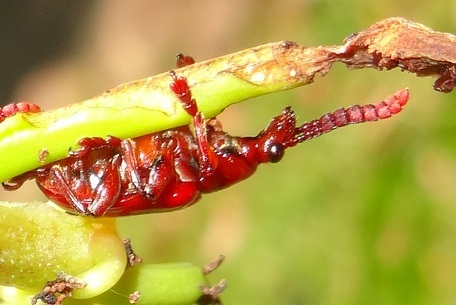 After some extensive searches, I came across the name Lilioceris smilacivora that feed on Smilax species . But, the antenna of Lilioceris smilacivora was described as "largely black" . Picture of this beetle is not available. 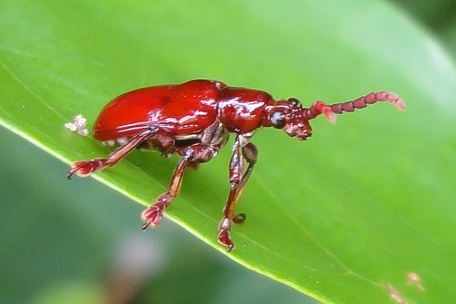 Another possible candidate is Lilioceris laticornis described as having "Antennae and legs entirely reddish" . 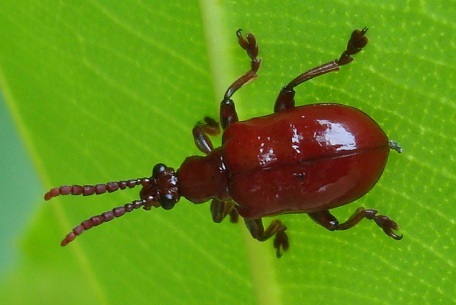 However, in another publication in the same year, Lilioceris laticornis was allocated a synonym status to Lilioceris cheni, which has black antennae and legs . 1. Schmitt M. The Criocerinae: Biology, Phylogeny and Evolution. Biology of Chrysomelidae. Series Entomologica 1988;42:475-495, page 476. 2. Gressitt, J. L. Chrysomelid beetles from the Papuan subregion, 1 (Sagrinae, Zeugophorinae, Criocerinae). Pacific Insects 1965;7(1):131-189, pages 136 & 146. 3. Warchalowski A. An attempt on a review of Lilioceris Reitter, 1913 - species from continental part of south-eastern Asia (Coleoptera: Chrysomelidae: Criocerinae). Genus 2011;22(1):95-122, page 99.